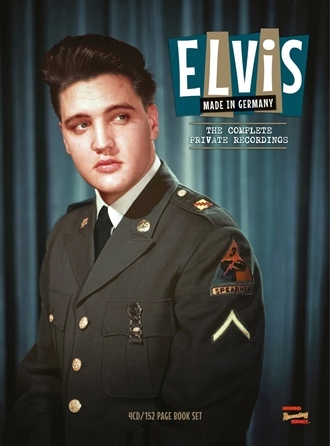 'Elvis - Made In Germany – The Complete Private Recordings’ 4CD set contains more than 3 hours of all the private recordings Elvis made while off duty in Germany when he was serving as a soldier in the US army during the 1958 -1960 period and, includes rare tracks from a recently discovered tape comprising over an hour of unheard personal recordings. Although the original tapes were damaged with noise, hiss and distortion, for the first time ever, all of Elvis’ recordings made in Germany, have now all been painstakingly cleaned, repaired, and restored, using the most sophisticated technology. 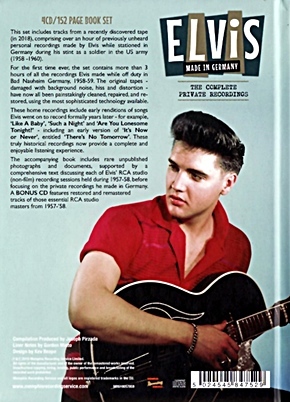 The 152-page hardback book contains rare unpublished photographs and documents, complemented by a comprehensive text provided by Gordon Minto, which discusses each of Elvis’ RCA studio (non-film) recording sessions held during 1957-58, before focusing on the private recordings he made in Germany. The BONUS CD features the essential RCA studio masters from the 1957-’58 period. 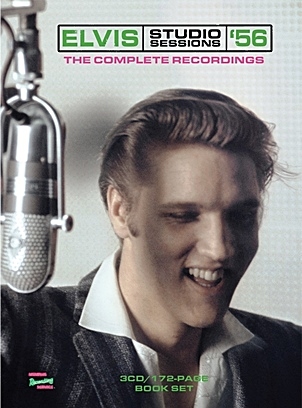 Elvis Made In Germany - The Complete Private Recordings, 4CD/152 page Book Set, Memphis Recording Service (MRS10057059), EU, 2019. Compilation produced by Joseph Pirzada, Liner Notes by Gordon Minto and Set Design by Kev Reape. The latest release from Joseph Pirzada’s Memphis Recording Service (MRS) continues its long and proud history of producing stylish, high quality releases which are "fan friendly" at an affordable price. Elvis Made In Germany, with its stunning never-before-published cover photo, implores that the narrative and audio elements are equally as good, and the set doesn’t disappoint (*save for one annoying issue). The narrative is provided by noted Elvis world identity, Gordon Minto (Elvis The Man and His Music), and as those familiar with his writings will know, the research and prose is first rate and often candid. Minto presents his account in chronological order and offers a solid record of Elvis’ life and events in the lead up to and while in Germany, including the death of Elvis’ beloved mother, Gladys. The engaging narrative brings to life what Elvis was experiencing and has a balanced blend of factual and commentary. Unfortunately, the material lacked edge – only ‘Wear My Ring Around Your Neck’ had any real commercial appeal. Secondly, although Scotty Moore and Bill Black had rejoined the band after falling out the previous September, it would have been very surprising if both men had not still harboured some residual ill-feeling. Furthermore, those around Elvis made little secret of the fact that his original combo lacked the skills and musicality that Elvis deserved – which must have been discouraging and demeaning for them. 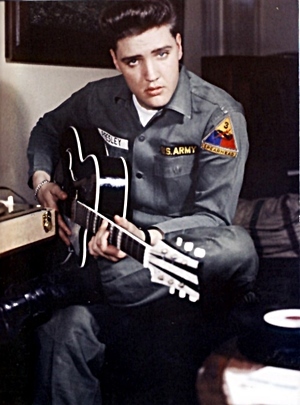 Self-evidently, it seems that while Parker was beavering away tirelessly – and publicly in this case – in the USA, setting up future film commitments and negotiating various other deals and concessions with the likes of RCA in anticipation of when Elvis was able to resume his career, Elvis’ role in this strategy was much more covert, though no less important, of course. He was instructed firmly to decline any offer to perform in public but, was instead, set the task of gathering and assessing the suitability of material for future recording projects – and determining whether or not he liked it well enough for his music publisher, Freddy Bienstock, to try to make a deal on the publishing – a key precondition nowadays for anything he was considering recording. 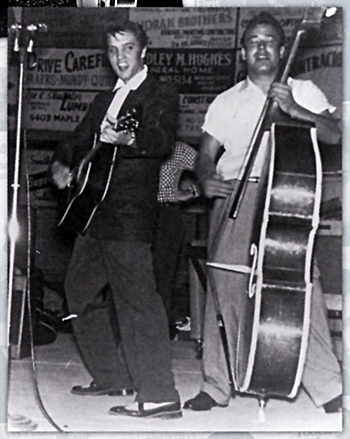 Elvis had always enjoyed performing in informal settings and so, when not on duty, it seemed fairly natural that he would spend much of his spare time singing and playing. 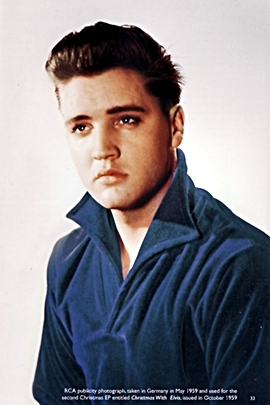 Whether or not there was ever a serious chance of Elvis cutting ‘Cool Water’, ‘Oh Lonesome Me’ or any of the other apparently off-the-cuff material remains debatable, but what is undeniable is that there is clear evidence that he and his pals devoted a considerable amount of time and effort into shaping and arranging particular songs – for example, ‘He Knows Just What I Need’ – a song which he recorded formally in late October 1960 for the instrumentally basic album His Hand in Mine – in much the same style the Colonel had hinted at in his letters earlier. My only issue with the narrative is that there should have been more of it! 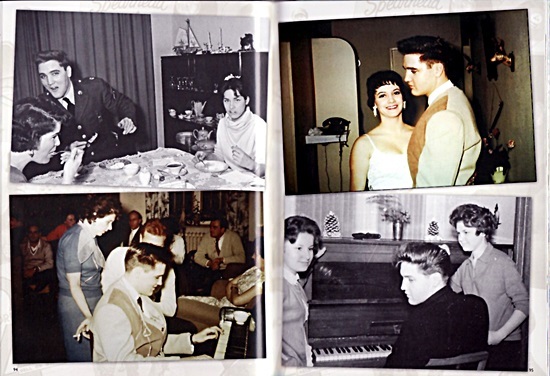 The book element features an introduction and 11 chapters which cover Elvis’ RCA Studio Sessions in 1957 and 1958, the tremendous reception he received on his arrival in Germany, Elvis at home, Elvis off-duty, life at Ray Barracks, Friedburg, the Home Recordings (which form the audio part of the set), and his farewell from Germany. The hundreds of images are wonderful, a heady mix of glorious color and b&w. 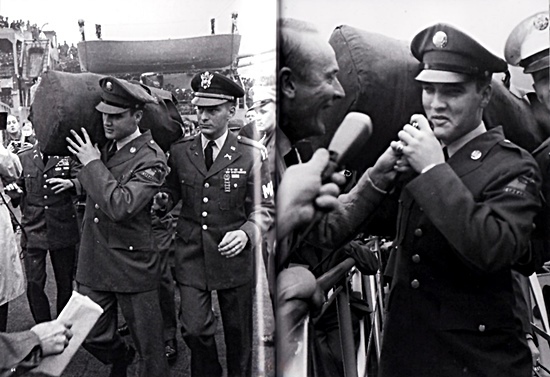 They range in nature from Elvis in Army uniform and publicity stills to Elvis relaxing with friends and fans, and Elvis out driving or at home. There are many visuals I don’t recall ever seeing before but given the incredible volume of photos of Elvis that have been published over the last half century it can be hard to know when any are really new. You will recognise many of the photos but I’d bet not all of them. The visuals don’t always align with the narrative but that will likely only concern Elvis purists. 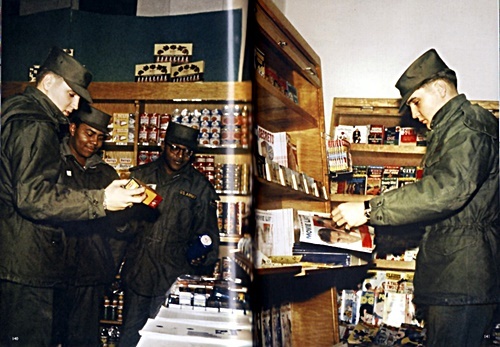 The images are sourced from the archives of a number of well known Elvis collectors including Patrick Janssen, Oskar Hentschel, Andreas Schroer, and Joseph Tunzi. Individual photos are not attributed. In addition, an array of fascinating historical archival material is a wonderful complement to the narrative and Elvis visuals. The material includes Billboard charts, magazine covers, session notes and record covers. As with previous MRS releases the overall set design is very good – Kev Reape being responsible for the design of this release. The set is a compact 7.5 x 5.5 inches which means it won’t take up too much room on your bourgeoning Elvis book shelves. The page design is strong with “neat ghost” Elvis images backgrounding the text and bordering many of the pages featuring only visuals. The text is presented in two column format and the font size is smallish but easy to read thanks to good line spacing and effective page backgrounding. The paper stock appears to be high quality semi-gloss. Package Verdict: With Elvis Made In Germany The Complete Private Recordings, MRS has produced yet another winning combination of narrative, visual and aural material. 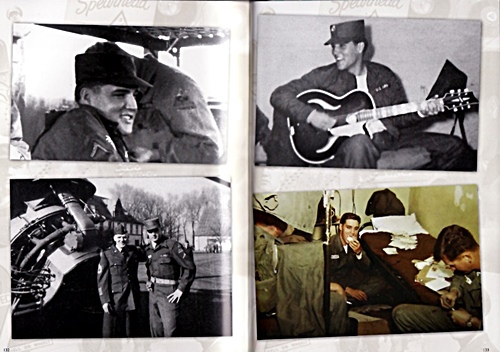 While the visual and audio elements dominate, the package is one which offers rediscovery of forgotten information, new insights, a visual feast, and a comprehensive aural record of Elvis’ informal recordings while in the Army. And its price won’t break the bank! * CD housing: The one annoying issue once again with this MRS set is the CD housing. CDs 1 and 2 slide/clip into a plastic casing in the inside front cover with CDs 3 & 4 fitting into a plastic holder in the inside back cover. Unfortunately the discs are wedged in firmly making it difficult to safely extricate them from their housing. And there are a number of reports that when the discs are returned to the housing they fit back in loosely. To be honest there should be an instruction “Press CDs gently downwards against plastic clips to release. Do not try and prise out” and then life would be easier. When the ‘A Golden Celebration’ RCA box-set was first released in 1985 one of the real highlights for Elvis collectors were the nine tracks that had been discovered of Elvis singing at home. Some were from his time in Germany while others were from the mid-60s back home in the US. These songs helped confirm fans’ presumptions and expectations that in his downtime Elvis would be sitting at home playing whatever music came to mind and from every kind of musical style. Unsurprisingly several of these would eventually be recorded officially by Elvis in the studio, some over a decade later. Despite the low quality of these tapes they helped capture the joy of Elvis singing to himself and friends, as well as giving fans an inkling of what he enjoyed performing just for himself - perhaps some were even demos for himself. Fans also needed to appreciate just how lucky they were to have these home-recordings captured for posterity. In 2017 FTD’s ‘A Date With Elvis’ featured one CD of Elvis’ German home-recordings while late last year another previously unknown tape of Elvis at home was discovered by Juan Luis Gonzalez and offered to one and all as a free download. FTD’s recent 'For LP Fans Only’ included 10 of the twenty-one tracks from that tape. 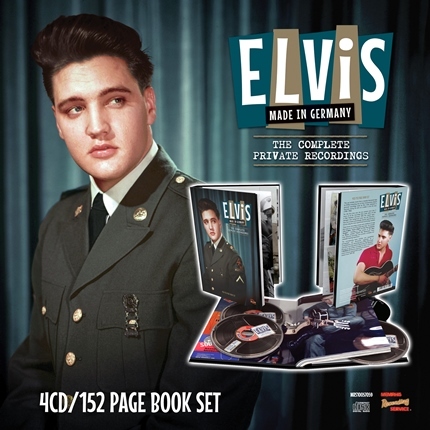 All these recordings took place during Elvis’ two years overseas in Germany for the US Army and they have now all been gathered within the new MRS 4-CD box-set. 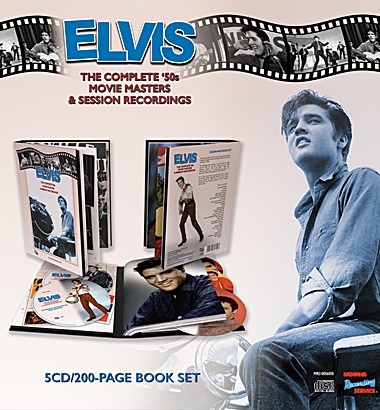 What this MRS set offers over other releases is Elvis’ Complete Private Recordings. 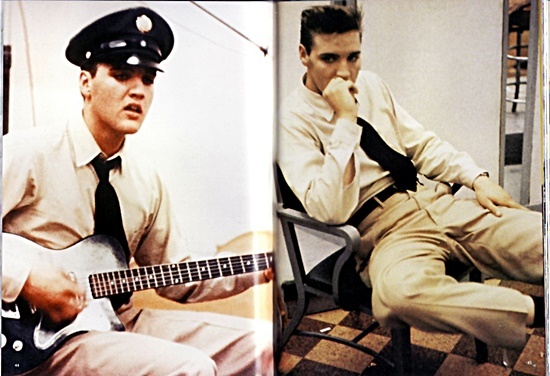 To be honest sometimes eight attempts in a row at one song, such as ‘He Knows Just what I Need’, can get a little tiring but there is a true fascination in listening to Elvis as he keeps trying to improve on his performance even if it was purely for home enjoyment. It was Elvis fan Juan Luis Gonzalez who discovered the new tape of Elvis singing at home and so it is excellent to see a thanks to him in the MRS credits and he has noted elsewhere “I want to publicly thank MRS. Excellent all the way around package. Very nice to see my name too.. thank you” Juan Luis. What is so fascinating is that although The Colonel had an issue with Elvis recording anything professionally in Germany, Elvis was still bursting with music. These three tapes, after all, only capture a couple of hours of Elvis jamming at home yet they contain so many songs that Elvis would later record for RCA release such as ‘His Hand In Mine’, ‘Like A Baby’, ‘Stand By Me’, ’I'll Take You Home Again Kathleen’, ‘I Will Be True’, ‘Danny Boy’ - even an attempt at ‘Are You Lonesome Tonight’ - along with the complete tape of Elvis singing ‘There’s No Tomorrow’ which would be reinvented as his classic single ‘It's Now Or Never’. Audio Quality: As always MRS’ “Studio D” audio engineer has done an excellent job in removing crackles, buzz and hiss from the original tapes and even some weird gaps (such as in ‘He Knows Just What I need’ & ‘Are You Lonesome Tonight’). Because the tapes were home-recordings and often over-modulated there are still some audio issues at points - such as the distortion and tape damage on ‘Stand By Me’ - that is impossible to fix. In comparison the FTD versions sound rather flat / muffled. Fans need to realise that these tapes were recorded very basically in a Hotel room or at home so they really should be played back on Loud-Speakers to recreate that “room” ambience. They do sound better played back that way. There is no doubt that listening to them on headphones or ear-buds can soon give you audio fatigue. SHORT REVIEW: Over three hours – 54 tracks - that all provide a wonderful lesson into what kind of music intrigued Elvis when away from the confines of the RCA recording studio. The fact that we can eavesdrop on Elvis and his friends relaxing and having fun while jamming on such a variety of music - Rock’n’roll, Country, Ballads, Gospel - is a real privilege. This is sensational stuff that should be of interest to any serious Elvis collector. 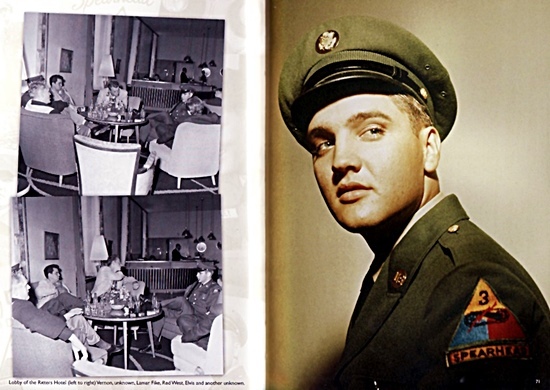 The first CD kicks off with Elvis’ Press interviews at the Brooklyn Terminal, New York on 22 September 1958 along with interview in the USS Randall. This neatly sets the scene for what follows…. Other treats are Elvis’ attempts at Nat King Cole’s ‘Mona Lisa’, Hanks Williams’ ‘I Can’t Help It’ and two charming versions of ‘Danny Boy’. Who knew that the fifties Rock’n’Roll Elvis would be fascinated by this old Irish lament and how extraordinary that Elvis would not officially record it until his Jungle Room sessions almost 20 years later. The delight here is getting the full tape and MRS have worked hard on the audio restoration. For example FTD decided to fade out ‘I Can’t Help It’ mid-song rather than try and fix it up. Here MRS gives us the full version and one wonders why FTD did not include it. From his own catalogue Elvis delves in to a few lines of ‘Loving You’ getting a little naughty at the end singing, “I’ll be screwed, blowing you”. Sadly FTD again decided in 2017 that Elvis fans are still not grown up enough to accept that Elvis wasn’t as pure as his movie image and edited this section out on their release! A real surprise is the inclusion of Elvis’ father Vernon singing two attempts at ‘I’m Beginning to Forget You’ with Elvis playing guitar. And guess what - Vernon isn’t so bad. It is an interesting insight into the influence Vernon’s musical tastes might have had on Elvis. 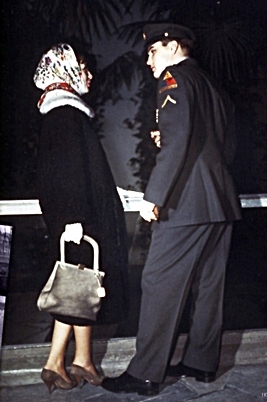 It’s truly an amazing opportunity to eavesdrop on Elvis and his friends chilling out after only three months in Germany. Elvis jokes, “Into the strange and wild interior of darkest Africa MGM sends a motion picture company on safari” as he kids around with his friends. Right in the middle of all this joking Elvis starts singing a short 30 seconds fooling around and scatting on the bassline of ‘Santa Claus Is Back In Town’. Of course the general chatting is not something you’ll play more than a couple of times – and it will never be released by FTD or RCA – but it still helps capture the craziness of the Memphis boys trying to keep themselves happy in this foreign country. Wrapping up Disc 1 is Vernon singing ‘I’m Beginning to Forget You’ followed by Elvis’ running through his own cool versions. This CD features the complete newly discovered tape of Elvis singing and playing guitar while in Germany. Here MRS gives us the tape’s full 55 minutes whereas FTD’s recent ‘For LP Fans Only’ featured less than 19 minutes of highlights. Charlie Hodge, Red West and Rex Mansfield are presumably there as well. Elvis works on trying to perfect the song multiple times ‘He Knows Just What I Need’ would of course be a key song on Elvis’ first Gospel album recorded over a year later. It’s almost like a proper studio session with Elvis commenting, “Y’all leaving me at one spot there” as they discuss how the harmonies and bass-line should work. Some of the rehearsals are delightful, and you can easily imagine being there watching the guys improvise. Just before the third complete run-though Rex Mansfield suggests, “You move in a little closer Elvis” and it is a charming try-out. The final complete version is a delight with the guys afterwards laughing with joy about their harmonies – the ending again being faded on the FTD release. A delightful romp through The Sons of the Pioneers old Western song ‘Cool Water’ follows (edited short on FTD’s version) before the real delight of an attempt on ‘Elvis Is Back’s ‘Like A Baby’. It’s short and sweet and only one verse although the gang keep jamming on it for a few minutes more after the FTD version has faded out. Elvis then decides to work on The Statesmen Quartet ‘His Hand In Mine’ with Red West and Charlie Hodge providing harmonies. They then go on, changing the lyrics, to try out ‘Her Hand In Mine’ and work through it six times adding a bluesy guitar to it at times. One wonders whether Elvis was considering recording a secular version for the future ‘Elvis Is Back’. There is no doubt that “I will never walk alone, if she hold my hand” sounds very cute. Elvis also kicks around Dean Martin’s Italiano-style ‘Return To Me’ which would have been charting at the time. The Col Parker suggested ‘Just A Closer Walk With Thee’ and ‘Take My Hand Precious Lord’ are heard in short snatches and future studio recording ‘Are You Sincere’ also features. A neat bonus is Red West singing a short version of Tab Hunter’s ‘Young Love’ which Elvis would kick around with the guys while setting up for the NBC Comeback Special a decade later. Hearing Elvis attempt ‘Are You Lonesome Tonight’ as a home-recording, including the full narration, is a revelation. The private jam is so close to Elvis’ studio version it is a stunning find. This could of course have been part of Parker’s plan to release some “Home-recordings” while Elvis was overseas. Had Parker sent over an acetate to inspire Elvis? Elvis 1966 ‘Stand By Me’ is one of my Gospel favourites yet here is Elvis trying it out in 1958! Unfortunately tape damage, Charlie’s falsetto and overload makes most of it challenging listening. At the end Elvis tries out a goosed-up fast version! This tape ends with a cute jam on Don Gibson’s country song ‘Oh Lonesome Me’ a big hit in 1958 which by chance had his classic ‘I Can't Stop Loving You’ on the flip side. It sure sounds like Elvis and the guys were going to keep partying after the tape runs out - and what a priviledge to be able to eavesdrop on the session. REEL 3 Piano - CD 3 – 73 minutes. 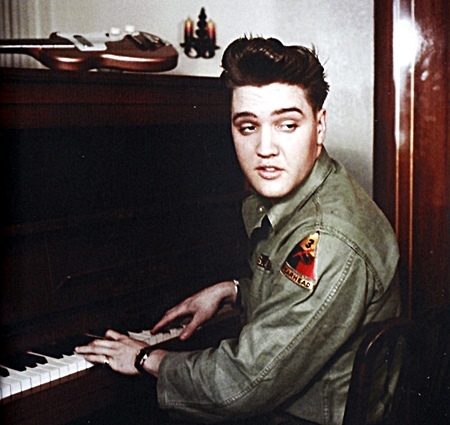 The third tape features Elvis playing piano rather than guitar. Several of these songs were chosen for release on RCA’s 1985’s ‘A Golden Celebration’ box-set. The majority of these tracks were released on FTD’s 2017 ‘A Date With Elvis’ however there is more than 20 minutes extra here that was edited off the FTD version including Elvis first attempt at ‘Soldier Boy’ and his rather charming second run through of ‘Send Me Some Lovin'. This sets starts with Elvis trying out Mahalia Jackson’s ‘I asked The Lord’ a song he seems very keen on as he returns to it several times. Elvis works on the finale several times which reminds one of Elvis’ later studio session working on the power-ending of ‘Surrender’. “Yeah” Elvis shouts out when he gets it right. The marvelous ‘Soldier Boy’ follows, two tender versions, and mid-way again includes one line of Elvis singing ‘Such A Night’! Elvis tackles the beautiful ‘Earth Angel’ – originally a 1954 doo-wop hit by ‘The Penguins’ but a song that perfectly suited Elvis’ delightful vocal. A splice of the two versions here would be issued on ‘A Golden Celebration’. ‘I'll Take You Home Again Kathleen’ is a song that Elvis would professionally record over a decade later and here he starts with a very nice Jerry Lee Lewis type boogie on a speeded-up version. Later on Elvis tries two alternate “slow” versions (unfortunately with more distortion) but these are more similar to Elvis’ 1971 RCA version. Elvis would also record Ivory Joe Hunter’s ‘I Will Be True’ at RCA in 1971 and here we get another superb personal recording with Elvis providing a beautiful yearning vocal. ‘It’s Been So Long Darling’, an old Ernest Tubb country number, gets the similar Elvis piano-boogie treatment. It is on this tape that Elvis tries the well-known home-recording of Tony Martin’s 1949 hit ‘There's No Tomorrow’ which would later be transformed to his stunning ‘It’s Now Or Never’. The R&B flavoured ‘The Titles Will Tell’ (as recorded by SUN artist Barbara Pittman) again features a brilliant, fiery vocal which, along with Elvis’ pounding piano, sounds surprisingly similar to the passion Elvis poured into ‘I’ll Hold You In My Heart’ twelve years later at his Memphis sessions. Other treats included on the MRS disc - but missed from the FTD version - are a quick verse of ‘At The Hop’, ‘Give Me Oil In My Lamp’, a naughty ‘Que Sera Sera’ “When I was just a little queer” segued into “Will I be a Hound Dog” plus a full 7 minutes of ‘Send Me Some Lovin’ albeit with some annoying distortion. The final part is a delicious 9 minutes of Elvis and Red West jamming on Sanford Clark’s 1956 hit ‘The Fool’ at his Goethestrasse home in Bad Nauheim and in fine audio quality too. There are some wonderful insights such as when Elvis has to ask Vernon “Would you mind getting these kids out the window, they are yelling and I can’t hear what I am doing”. Elvis would return to this song in 1970 for his marvelous ‘Elvis Country’ album. Several of these songs could have been easily slotted into the 1960 ‘Elvis Is Back’ sessions however it is the full version of ‘There’s No Tomorrow’ that would be the real key to Elvis’ future 1960 re-emergence. Although he had stated in interviews that he enjoyed ‘Mario Lanza’ who would have thought, during the Rock’n’Roll years of 1958-59, that it would be Elvis’ Latino influences that would power his future Number 1 singles? CD 4 ‘Bonus Disc’ The Essential RCA Studio Masters 1957 / 58 - 79 minutes. With MRS having released the 1950s Movie Masters, as well as Elvis’ complete 1956 sessions, I was not sure how they could complete a nice book / package for just 80 minutes of left-over 1957 / 58 Masters so this Bonus Disc (with detailed text from Gordon Minto and over 40 pages of relevant studio photos) actually makes sense. The CD features 32 Studio masters and they do make intriguing listening as without the Loving You, Jailhouse Rock and King Creole recordings they present themselves as Elvis working on possible Singles and B Sides. While the CD does also include Elvis’ Christmas album session I separate those into another playlist. For those technically interested below is a direct audio comparison of ‘All Shook Up’ between this MRS version (top) and SONY’s 'The Complete Masters' release. You can easily see why the MRS master will rock your hifi compared to the RCA release and it does sound fabulous - in fact Elvis' guitar back-slap has never sounded clearer. Of course fans who respect the dry studio original tapes may prefer the FTD releases - with the excellent audio work of Kevan Budd - but there is no doubt that these remasters will certainly rock-out if you play them on a new BOSE system or car stereo. This makes sense when one considers that MRS’s main market is probably the ‘HMV’ or ‘Amazon’ buying general public, along with the core Elvis collectors. ‘All Shook Up’ starts with Elvis’ marvelous comment “I got it swinging” before his count-in. It’s a great Elvis comment and start to the CD, which for some reason has never been included on an official release as yet. Similar MRS treats are the full intro to the album version ‘Don’t Leave Me Now’ “Let’s get it this time. DJ, give me a little heavier beat, I feel like I’m draggin’”. MRS also include the count-in to ‘White Christmas’ that was inexplicably left off FTD’s Classic Album release. Apart from the stunning singles I can play tracks such as ‘I Need You So,’ ‘Is It So Strange’ and ‘Have I Told You Lately That I Love You’ all day long! Interestingly without Elvis’ stunning Movie singles you can see that there was a period (I Beg of You / Wear My Ring Around Your Neck / Doncha' Think It's Time) where Elvis’ composers were struggling to come up with sure-fire stunners and then - at his last June 1958 session - Elvis blasts through with the amazing ‘I Need Your Love Tonight, ‘A Big Hunk O' Love’, ‘A Fool Such As I’, and ‘I Got Stung’ all in one evening. Fans need to be aware that as this is a Public Domain release tracks such as ‘Tell Me Why’, ‘When It Rains It Really Pours’, 'Your Cheatin' Heart' and ‘Ain’t That Loving You Baby’ cannot legally be included as they were released in the mid-sixties and so they do not pass the “50 Year” PD law. Overall Music Verdict: While it is understandable that this complete set of Elvis’ German home-recordings will never be on high rotation in Elvis collectors’ regular playlists they do impart a truly important history lesson. Over three hours – 54 tracks - that all go to provide a wonderful lesson into what kind of music intrigued Elvis when away from the confines of the RCA recording studio. The fact that we can eavesdrop on Elvis and his friends relaxing and having fun while jamming on such a variety of music - Rock’n’roll, Country, Ballads, Gospel - is a real privilege. This is sensational stuff that should be of interest to any serious Elvis collector and while I did download these tapes for free last year, the audio improvement makes them far more enjoyable. Throwing in the 57 / 58 Studio Masters as a Bonus Disc - and the hundreds of photos of Elvis at the time - just adds to the value for money. All-in-all a great package. PS - Nice to see EIN contributor Tony Stuchbury thanked for his assistance with this set.